Hello ... Hello ... my old friends ... It's great to see you once again! Back in 1977, on the cusp of the rise and rise of the Electric Light Orchestra, Harvest [ELO's first UK label] released one of their now many compilations of selected tracks from their eponymously entitled first album  and: "ELO 2" . "There is an inclination, an unfortunate one, to disregard the past of a band that has spent many years patiently building in the belief that eventually the masses would accept their music. 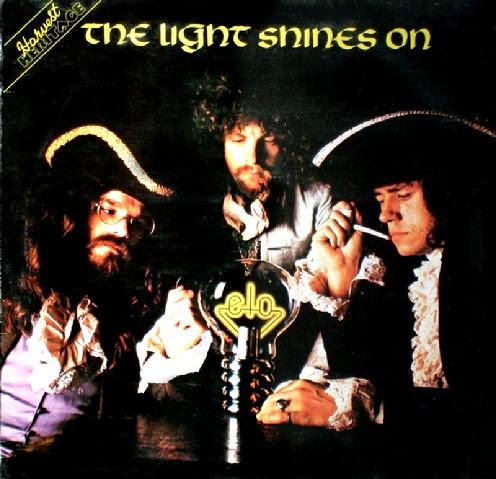 Such is the case with the Electric Light Orchestra, but this album should go some way towards redressing the misbegotten notion of ELO as an overnight sensation. The ELO was born seven years ago in a spirit of experimentation. The theory was to play with the idea of mixing contemporary rock music with the instruments and arrangements of the classics, just to see what would happen. It was a courageous adventure, one which was as open to failure as it was to success. As it has already been well documented, the ELO formed as an off-shoot of The Move, then one of Britain's most important sixties pop groups. Roy Wood, the mentor behind Move's achievements, had decided that another outlet was required to realise his ambitions, so with Jeff Lynne and Bev Bevan, the Electric Light Orchestra came into being. Not surprisingly, Wood hogged all the limelight, although he bent backwards to ensure that Lynne, who was playing as important a part in the development of the ELO concept, received a fair share of the credit. When Lynne's contribution to the first ELO album [he wrote half the songs] was ignored by the media, Wood felt that the only option open in the circumstances was to quit the band. This he did in June, 1972, and the media was left with no choice but to take a fresh look at Lynne's talent. Lynne, who had earned a healthy reputation as a player and writer with Birmingham group the Idle Race for four years before joining the Move in 1970, thrived in his new position as unchallenged leader, and, with Bevan, set about the task of forming ELO as a working band, as opposed to the tentative unit it had previously been. From that base, Lynne shaped the band's future, quietly confident that the public would show their appreciation. And they did, first in America, then in Britain, where barriers of reluctance slowly tumbled down in the face of some of the world's best rock music. The music on this album, then, is the foetus from which the ELO experiment expanded. It is important music and one of its finest characteristics is the enthusiasm with which the task of merging rock and classical is tackled. There are songs from the first two ELO albums, with compositions from both Roy Wood and Jeff Lynne. 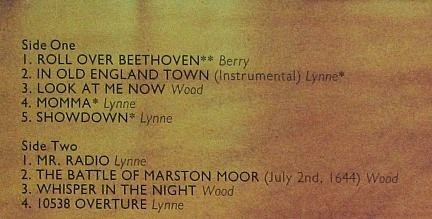 It's interesting to note the slight change in Lynne's compositions from "ELO 2" which appear here ["In Old England Town" and "Momma"], which were written without Wood's influence, in contrast to his earlier material. Fans who recently picked up on ELO will undoubtedly realise that during its embryonic stages, the band were much heavier proposition. The songs and arrangements are definitely more demanding than the more recent compositions, but get inside them and they're twice as fulfilling. In this collection, too, is the classic "Showdown", a hit single which was a forerunner to "Evil Woman" and "Livin' Thing". Those three songs bear startling similarities. And, of course, there's the anthem, "Roll Over Beethoven", the rocking statement of intent. As the man said, "Roll over Beethoven,dig these rhythm and blues." HARRY DOHERTY, Melody Maker"